Summary: The was a slight risk of a cold core event over a large portion of NE this day. Scott and I departed Denver around 0600 with an initial target near North Platte. This is truly one of the more mind boggling set ups I will ever chase. When we arrived in North Platte, temps were in the high 30′s. You could see your breath. We hung out near I-80 for a good portion of the day then headed east to Gothenburg for a couple hours as convection was starting to occur to the southeast of our location. I got a call from Zach Young that a vortmax had just cleared the front range and that the disturbance should reach us in a few hours. We began heading back some time after that thinking it was going to be a complete bust and that the highlight of the trip was going to be Scott taking pics of some deer skull in a field or me hijacking his Facebook account. Just before we got to Maxwell storms began to fire north and south of North Platte. We headed north out of Maxwell to highway 92 and then west to try and intercept a storm that was beginning to show signs of rotation south of Stapleton. Storm motion was a crazy 55kts, so if you didn’t get in front of it early, you were going to miss whatever it would produce. As we approached Hwy 83 from the east suddenly we could see classic supercell structure and a very well defined inflow tail from the north into the core of the storm. We stopped just shy of Hwy 83 and within a minute or two the first tornado dropped. There were patches of SNOW all around us and we had our winter coats on! This was like something out of a bad SciFi movie, but it was really happening. The first tornado dissipated but before it did, the 2nd tornado began to form immediately. As that dissipated, another tornado formed immediately…..all occurring in rapid succession. The storm was rapidly speeding by so we jumped in the truck and sped off to the north to try and stay ahead of it. When we reached a good position the storm was all done with what she was going to give us, but WOW……what a totally unexpected show. 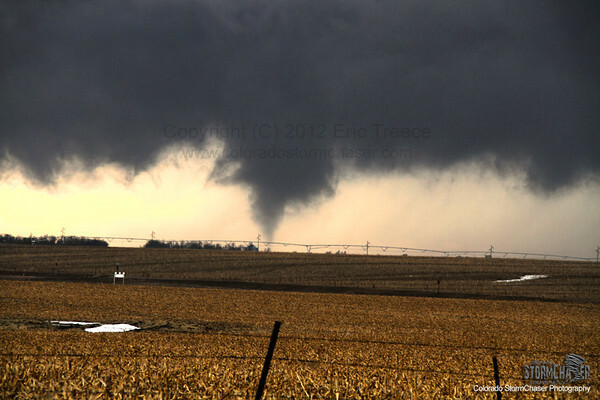 Somewhere along the way afterwards we had received word that this these were the first documented tornadoes ever in Nebraska in the month of February. That was pretty cool! The first tornado touches down.